Enhance your health and wellness. First developed in Sweden, accupressure mats provide an easy way to enjoy at home relief from stress and tension. The Spoonk™ Mat helps the body release endorphins through pressure from the mat's discs. They may stimulate specific reflex points throughout the body to release blocked energy, ease tense muscles and create deep mental and physical relaxation. You can treat your body and calm your mind in just 20 to 40 minutes on the mat. 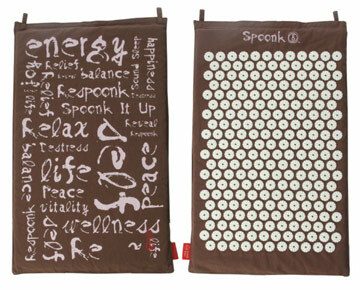 The Spoonk mat will energize you in the morning and help you unwind in the evening. Regular use will create the desired level of relaxation in your body that prevents the accumulation of stress and tension. Eco foam made in the USA. Made with 55% organic hemp and 45% organic cotton, soy-based EcoFoam, and non-toxic recyclable ABS plastic stimulation points, the Spoonk Acupressure Mat not only allows you to balance body and mind, but also sustainability and environmental responsibility!